•	Early indications are that October was another month of slow but positive growth in the U.S. and abroad. The monthly nonfarm payroll number for October was the strongest of the year, suggesting that weakness in August and September’s numbers was just noise. Emerging markets continue to be a small drag on the U.S. economy, but there are no signs of a crisis at this point. On the monetary policy view, the Fed continues to prepare the markets for tightening, perhaps at the December meeting. •	At 271,000 new jobs, the month-to-month change in nonfarm payrolls released in last Friday’s employment report was the strongest of the year. In addition, the year-over-year change in wages was as strong as it has been since the crisis, up 2.5% year-over-year. We can hope that wage gains hint at more of the economy’s gains accruing to average Americans to build a firmer foundation for a sustainable recovery. It is worth noting that as the expansion ages we can expect monthly employment gains to moderate and to see strength in the labor market represented as additional wage growth. •	On the international scene my view continues to be fairly strong growth in the developed world and faltering growth in the emerging world. 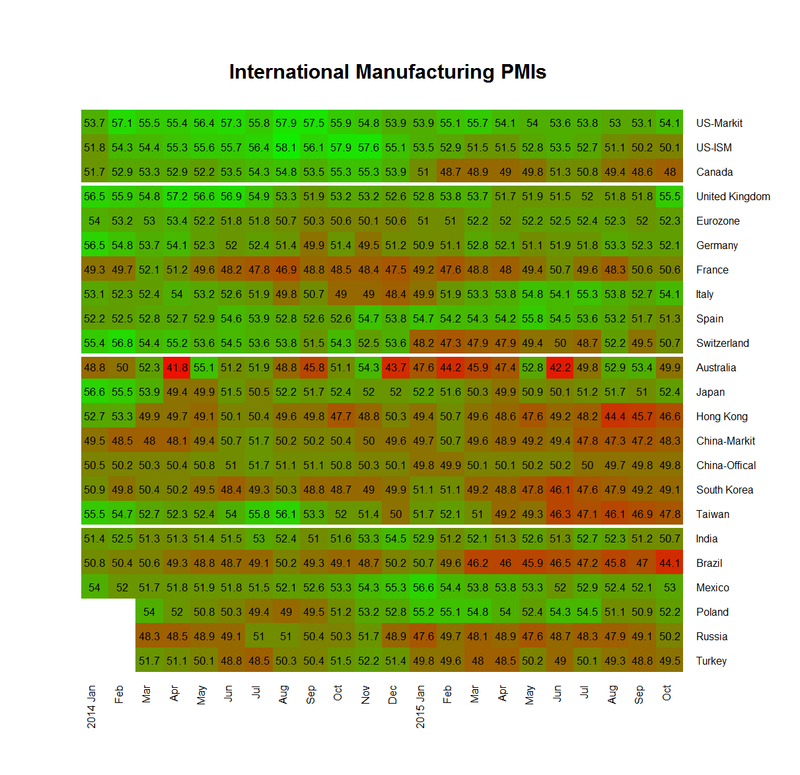 Below, I plot the Purchasing Managers’ Indexes for the major international economies. For China (the epicenter of current concern) the PMIs stopped falling in October, though only time will tell if this level will be followed with renewed expansion or further deterioration. The economies most associated with exporting intermediate or raw goods to China (Australia, Taiwan, Hong Kong, Korea) continue to show contraction in the their PMIs. Indeed, these countries are seeing expectations of 2016 growth marked down. At the same time indexes ticked up in the Eurozone, the UK and Japan last month and a GDP-weighted average PMI increased in October. •	Why is the Fed interested in rising rates? The FOMC seems to believe the labor market is close to full employment and that core inflation should move back to its 2% target in the next two years or so. Given the uncertain lags associated with monetary policy, the FOMC believes it is best to start to act now. •	Overall, I view the information released in the last month as supporting a slightly more optimistic take on U.S. growth.